It’s what is inside that counts. An expression that applies to the Interior Engineering course in every respect. Whether its aeroplanes, ships, trade fair stands or shops – glass, metal and plastic now work alongside wood in providing new perspectives on modern interior engineering. The Rosenheim course closes a gap in the educational structure and is unique in the German-speaking world. Through its combination of business administration, production engineering and construction qualifications, as well as its close links with regional companies, the course offers promising career prospects. The multi-faceted training with its practical focus qualifies graduates for various roles. Employment in product design, the development of functional constructions, and the planning, implementation and marketing of production processes are just some of the many possible careers. 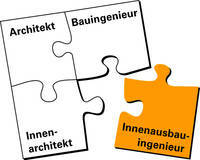 Flyer "Bachelor´s Degree Programme in Interior Engineering"